From brand strategy development and creative design to channel sales and distribution, right through to influencing consumers and shoppers’ purchase decisions, we have the services to meet our clients’ needs. 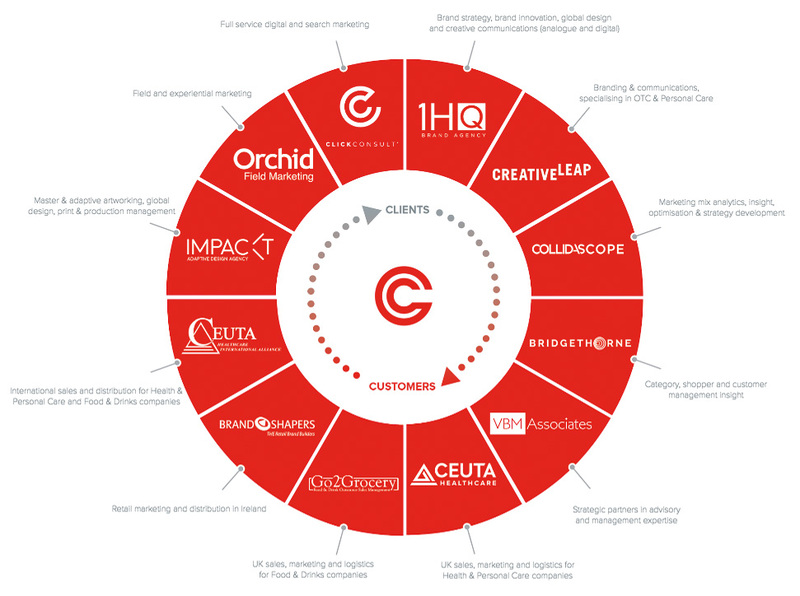 You can engage with one or more of our companies for a seamless, end-to-end, or selective brand management solution. Used individually or in combination, they offer focused expertise to implement your brand strategy and realise your ambitions for your brand’s success and profitability. We will bring new speed, agility and cost efficiency to the growth of your brand, through our unique 5-step process. with you to get to know you, your business, your values and your culture, so we can get to the heart of understanding the brand challenges you face. new opportunities and ideas for your brand and craft a focused and inspiring strategy for growth. and distil our understanding into practical and achievable growth strategies, never losing sight of your financial imperatives and cultural considerations. strategies for your brand to embrace all relevant sectors, channels and touchpoints, delivering them with complete consistency and cohesion. our ideas and strategies into powerful assets that deliver growth across designated markets or trade channels, using our integrated platform of services. Through our unique ‘Brand Fostering’ service, we will take ownership and responsibility for the management and growth of your brand whilst defending its equity and enhancing its value. From our offices in the UK, Ireland, New York, Rotterdam and Bangkok, we support brands for leading blue chip companies, investors, overseas companies and entrepreneurs. Because we have trusted partners on location around the world, we understand local markets, cultures, regulations and customs. We can launch, develop or grow your brand successfully in any region or country, combining our core strategic, creative and operational skills with carefully managed local delivery. Through our alliance of global partners, we can distribute and support brands in over 100 international markets. We work with trade distributors, wholesalers and retailers and will put in place whatever channel arrangements are best for your brand.